Tosho-gu Shrine, Ueno Park, Tokyo. 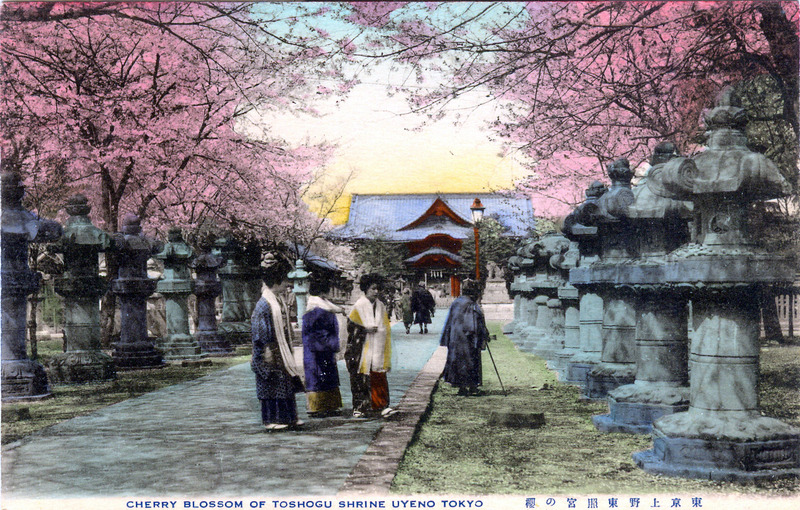 “Cherry blossom of Toshogu Shrine,” Ueno, Tokyo, c. 1920. · Life is like walking along a long road shouldering a heavy load; there is no need to hurry. · One who treats difficulties as the normal state of affairs will never be discontented. · Patience is the source of eternal peace; treat anger as an enemy. · Harm will befall one who knows only success and has never experienced failure. · Blame yourself rather than others. · It is better not to reach than to go too far. 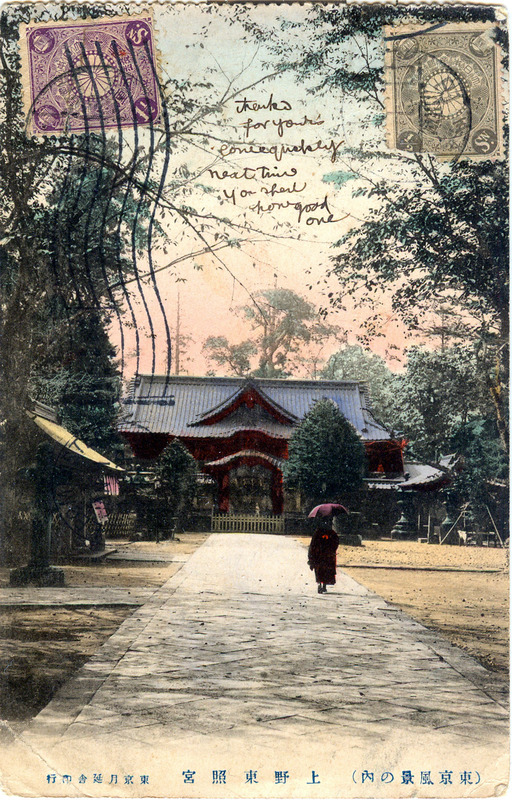 Tosho-gu Shrine at Ueno Park, Tokyo, c. 1910. Tosho-gu shrines, any Shinto shrine at which Tokugawa Ieyasu is enshrined, are found throughout Japan. During the Edo period, these shrines reached 500 in number. After the Meiji Restoration, many were abandoned. The most famous Tosho-gu is located in Nikko. But, in the southwest corner of Ueno Park, near Shinobazu Pond, sits the Tosho-gu-kyu [capital illumination government shrine] dedicated to the first Tokugawa shogun [general], Ieyasu. Completed in 1627 in accordance with the dying wish of Ieyasu (1543-1616), the first Tokugawa shogun, Toshogu Shrine has survived far longer than did Ieyasu’s authoritarian regime and his progeny who ruled Japan until 1868. Ieyasu seized power in 1600, received his appointment as shogun in 1603, abdicated from office in 1605, but remained in power until his death in 1616. Neither regal or glamorous, the shrine emerged unscathed from the Battle of Ueno in 1867 (the last stand of the Tokugawa shogunate), the 1923 Great Kanto earthquake, and the 1945 wartime firebombings of Tokyo. The shrine remains standing today and is open to the public as a vital, visible bridge connecting two widely divergent epochs: the histories of Feudal Edo and of Modern Tokyo. 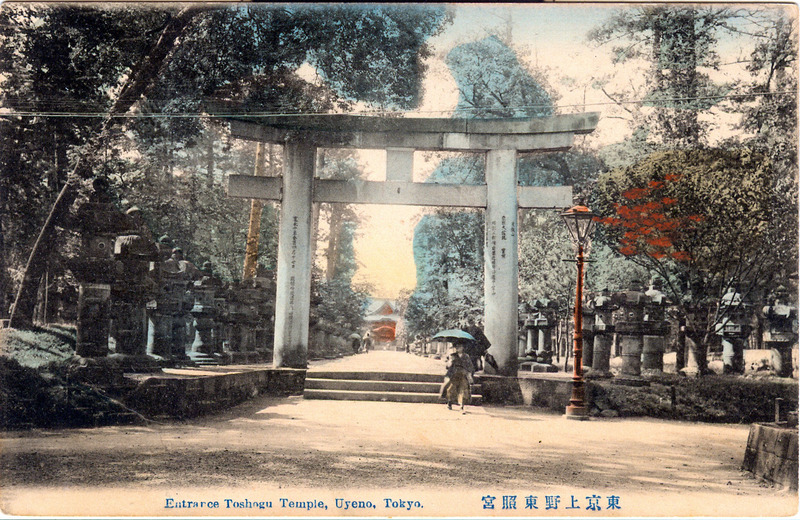 Entrance to Tosho-gu Shrine, Ueno Park, Tokyo, c. 1910.